The first main party event this year will be on Wednesday night after the races. Hammer Down Boating, along with Team Envy, Gone Again Racing, Hurricane of Awesomeness, and IR Designs is inviting all to attend a get together at Rick's Key West on Duvall Street from 7pm until the end, (they say the end of liquor), but it may be the end of attendees standing upright cause I hear Rick's has a pretty good supply. Hammer Down's Facebook page, https://www.facebook.com/HammerDownBoating , has involved good participation from the performance boating industry, and they do their very best to keep the information accurate and flowing. Here is their invitation for all of you to attend and enjoy their hospitality. As they show on the invitation, there are also other hosts involved. One of those, Team Envy, will have their all new Mystic 52 at their first race. They've had a few setbacks this year, so here's hoping they have tremendous good luck this time. It is quite the boat so make sure you tell Chris and the gang Hi. Another of the hosts, Gone Again Offshore Racing, has the fastest 32 Skater in the world and proves it just as often as he gets the chance. When we were in Biloxi this spring, Kenny took the boat through the radar at 182 and Pete Boden got this awesome shot of the boat at speed. Great guys to chat with and spectacular to watch when they have that boat dialed in on a run. Give Kenny and the team from Gone Again some major kudos for having some major cojones and doing an incredible restoration. If you get the chance, ask Kenny where he will be running next and try to take the opportunity to go watch. Some others to keep your eyes open for is the Hurricane of Awesomeness race team from Maryland. Kevin, Britt, and the rest of the combined crazies from this group are just a kick to hang with. You never know what they may pull, and over the past couple of years some of the stories and pictures make us laugh out loud much of the time. I'll not put any of them in this story, but you may get them to tell you a couple stories. Hopefully Britt's Dad, Art Lilly, will be there for some, if not all, of the event. If so, make sure to say hi and thank him for all he's done for the sport we all love. Tug It Racing and Lilly Sport Boats have pooled their capabilities to take a shot at an elusive World Championship, and we wish them luck. It ain't easy as we know so very well. The host last in this story, but certainly not last in their capabilities, is IR Designs. Their apparel design proficiency will be on display and maybe some lucky attendee will win one. Take a good look at their displays. As stated on the flyer, there will be some contests going on for prizes, including the tattoo placement contest for all ladies 18 and over to enter. Some others in attendance to assist with the upbeat atmosphere, the Fireball Girls, will do their very best to keep everyone smiling and involved. So, have a great time and make sure everyone stays safe and happy. Mystics My Way and Qatar, one on the front, the other on the back. Want to WIN a $1500.00 Crew Shirt SPONSORSHIP for your Power Boat race team? 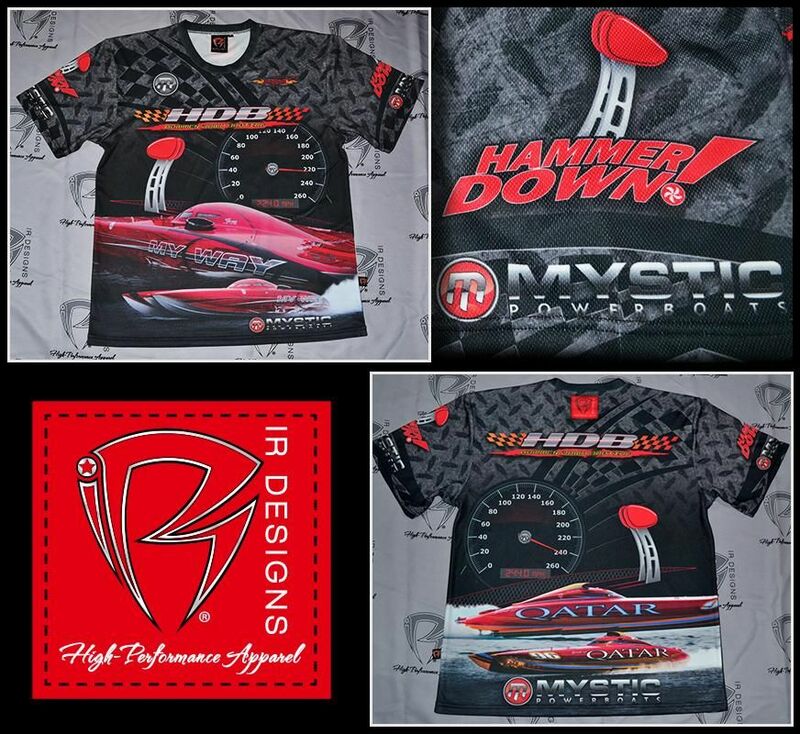 We've combined forces with Hammer Down Boating to GIVEAWAY a $1500.00 IR Designs Gift Certificate, to one lucky team! 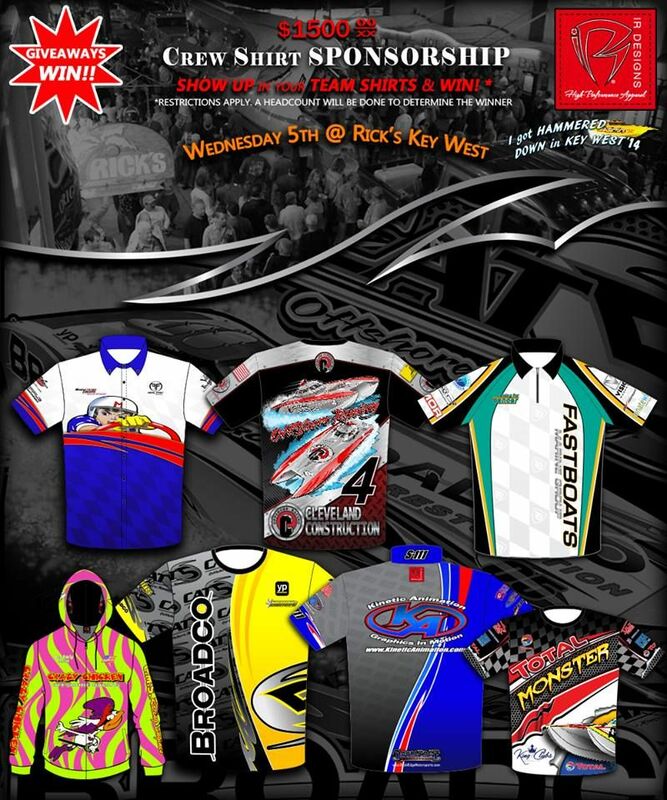 Show up at Rick's Key West on November 5th (7pm) in your current team uniform, and you'll be in the drawing to WIN! The largest team in attendance (by a head count) will walk away with the Prize! There can only be one winner, so be sure to gather up your crew & fans to HAMMER DOWN for chance to win your very own custom Crew Shirts by us. You MUST BE in your team shirts to win- Terms and conditions apply. Please email us (info@ir-designs.com) for a full list of contest rules & restrictions. Only 25 hours till party time! !